Includes: A premium table for ten guests at the Fashion Show luncheon and ten reserved VIP seats for the Fashion Show, swag bags for you and your guests, recognition in the Fashion Show program, recognition in the Fashion Show invite, recognition on the Junior League of Cincinnati's website, and the opportunity to place an ad in the Junior League of Cincinnati's Perspectives magazine. Those who purchase tickets after 3/13 will not be featured on the invite or program. Includes: Four premium seats at the Fashion Show luncheon and four reserved VIP seats for the Fashion Show, swag bags for you and your guests, recognition in the Fashion Show program, recognition in the Fashion Show invite, and recognition on the Junior League of Cincinnati's website. Those who purchase tickets after 3/13 will not be featured on the invite or program. 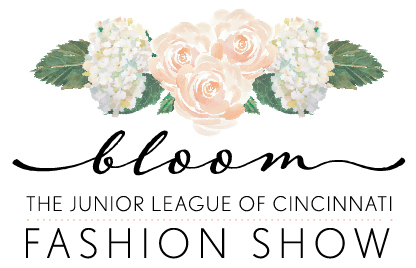 Includes: EARLY BIRD PRICING - One premium seat at the Fashion Show luncheon and one reserved VIP seat for the Fashion Show, swag bag for you, recognition in the Fashion Show program, recognition in the Fashion Show invite, and recognition on the Junior League of Cincinnati's website. $25 discount if you purchase two Host/Hostess tickets ($275 for two tickets, discount applied at checkout). Ticket prices will increase after February 1, 2019. Includes: EARLY BIRD PRICING - One premium seat at the Fashion Show luncheon and one reserved VIP seat for the Fashion Show. Ticket prices will increase after February 1, 2019. Includes: EARLY BIRD PRICING - One seat for the Fashion Show. Ticket prices will increase on February 1, 2019. Includes: One premium seat at the Fashion Show luncheon and one reserved VIP seat for the Fashion Show, swag bag for you, recognition in the Fashion Show program, recognition in the Fashion Show invite, and recognition on the Junior League of Cincinnati's website. $25 discount if you purchase two Host/Hostess tickets ($335 for two tickets, discount applied at checkout). Those who purchase tickets after 3/13 will not be featured on the invite or program. Includes: One premium seat at the Fashion Show luncheon and one reserved VIP seat for the Fashion Show. Includes: One seat for the Fashion Show. Includes a delicious luncheon and reserved seating at the the Spring Fashion Show!